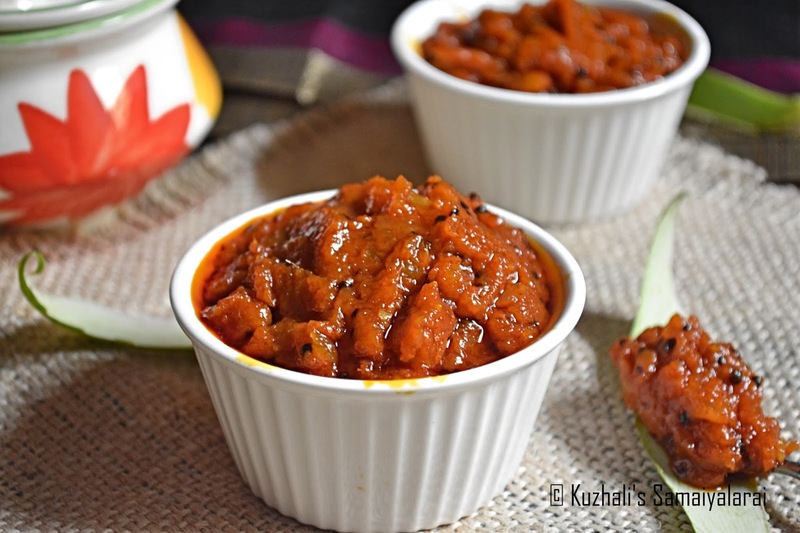 Mango thokku is a traditional pickle recipe which will tastes great with the combinationation of spiciness, sourness and mild sweetness. This is little different from the mango pickle. It’s shelf life will not be more like mango pickle. 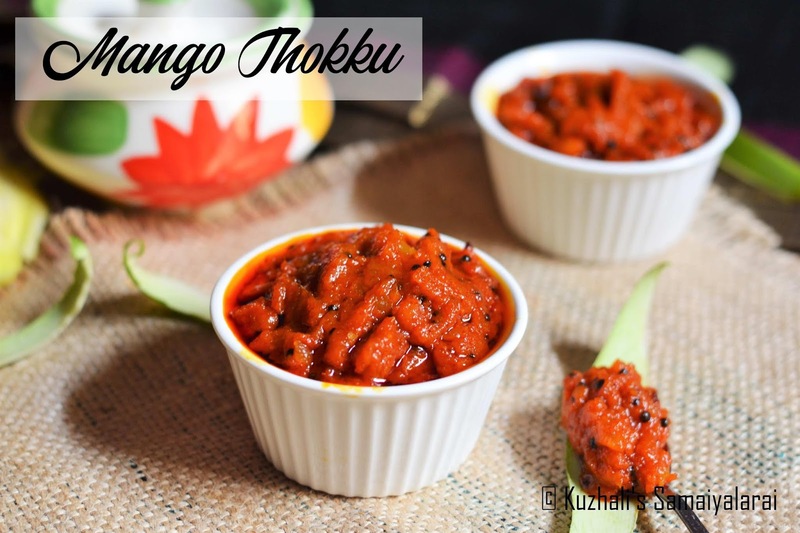 Th method of making this mango thokku is so simple and it is a fool proof recipe. So don’t forget to try this recipe if not before. I can say this thokku as spicy halwa, yes , it’s texture will be like that only. 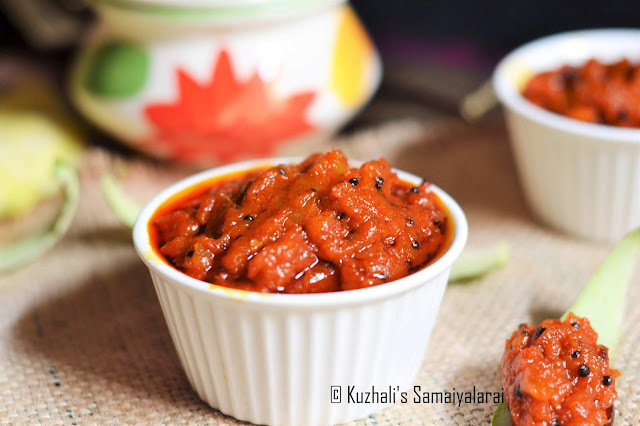 It tastes awesome with curd rice, and even you can have it with any mild spiced varity rice, mor kuzhambu rice etc., there is no limits , if you start to love this thokku, you will eat as it is like me always J.
I can say this is the top most thokku/pickle which I love a lot and I have no words to explain how much I like this. As the name says, the main ingredient is raw mango. In tamil ottu manga/kili mooku manga is best to make this thokku. 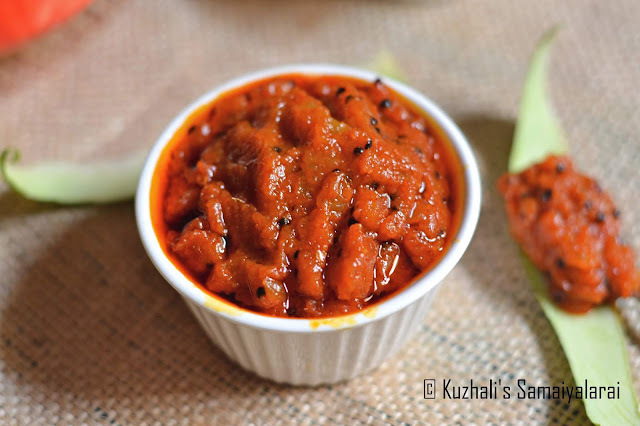 You can use any other variety too, but adjust the spiciness and sweetness as per the sourness in the mango. 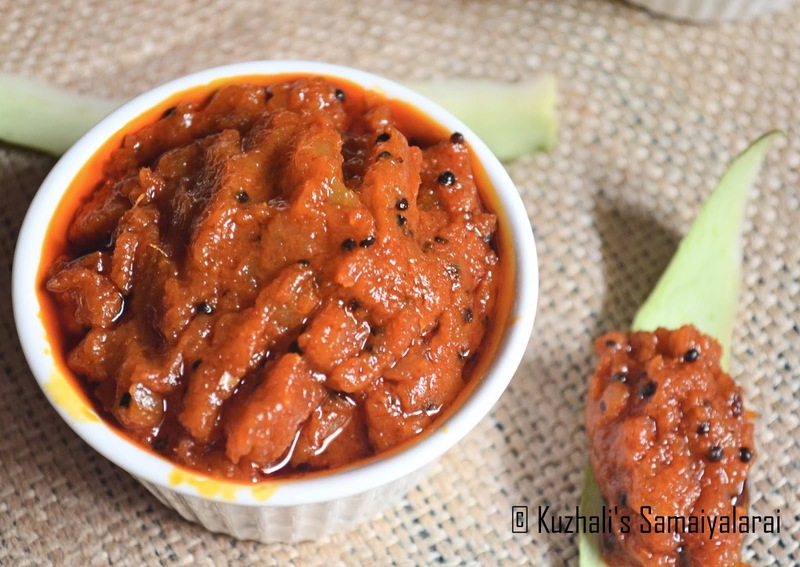 Please check the other Pickle/Thokku recipes here in my blog. Please check the below links for the other mango recipes. Wash and peel the skin of the raw mango. Then chop the mango into slices and keep it aside. Roast the fenugreek seeds and grind them into smooth powder. In a heavy bottomed pan add the oil and let it heat. Once the mustard seeds got spluttered, add the asafoetida and then chopped mango. Saute the mango well for 3 to 5 minutes. Close the pan with a lid and let the mango to cook well. Heat should be low medium. Open the lid and stir in between to avoid burning at the bottom. This step will take around 10 minutes(approximately). Once the mango got cooke dwell, mash it with the back of the ladle. If the mangoes are cooked properly, you can mash them easily. To cook the mango no need to add water. The mango will cook in the oil itself. Once the mangoes got mashed well, add the red chilli powder and turmeric powder, and mix well. Let the thokku to cook well for 3 to 5 more minutes. Add little more oil if the thokku is dry. Finally add the fenugreen powder and jaggery. Mix well. Let the thokku to cook for 2 more minutes and remove from heat. Let it cook down completely and then store in a dry air tight bottle. Always use clean dry spoon to take the thokku whenever needed. This thokku will be good for 1 week in room temeperature and for upto 1 month if refrigerated. 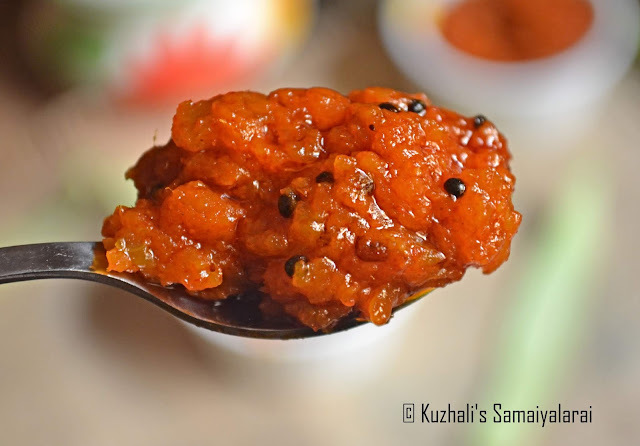 Some may grate or grind mango and make this thokku, but I like it by chopping method and it will tastes really good. 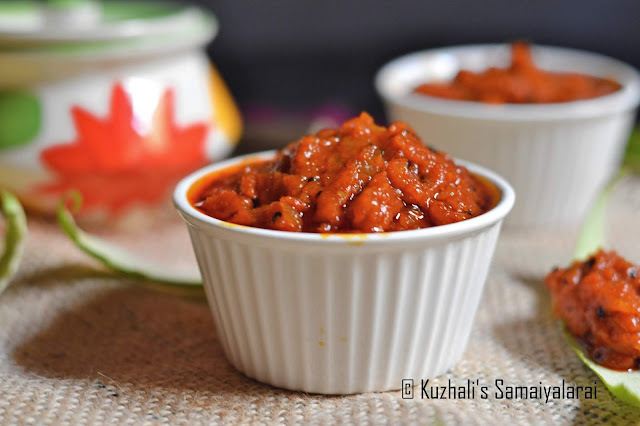 Adjust the spiciness by adding/reducing the chilli powder as per the sourness of the mango used. Addign jaggery at the end is important as it helps to balance the taste of the thokku. Store the thokku in clean, dry air tight glass bottle to keep it good for more days. In a heavy bottomed pan add the oil and let it heat. Then add the mustard seeds and let it splutter. Add salt . Stir well.Close the pan with a lid and let the mango to cook well. Once the mango got cooked well, mash it with the back of the ladle. If the mangoes are cooked properly, you can mash them easily. Add red chilli powder and turmeric powder. stir well. This is the right blog for anyone who wants to find out about this topic. You realize so much its almost hard to argue with you . You definitely put a new spin on a to pic thats been written about for years. Great stuff, just great!